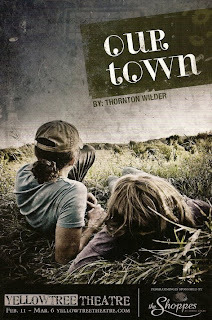 Our Town is a classic American play written in 1937 and set in the early 20th century in a small town in New Hampshire. It deals with the simple to profound events of every day life, from making breakfast and doing homework, to getting married and burying a loved one. I've never seen this play before, but I can't think of a better place to see it than the small intimate stage of Yellow Tree Theatre, my favorite theater in the suburbs. The play is performed in three acts, with the "Stage Manager" acting as narrator, played by local musician Blake Thomas with a comforting and steady voice that guides us through the action of the play. We meet many people in the town, from the milkman to the constable to the town drunk, but the focus is on the Gibbs and Webb families. George Gibbs and Emily Webb (played by co-directors Jason Peterson and Mary Fox) are teenagers and best friends in the first act, and the second act features their wedding at a young age. The third act takes place in the cemetery, with the deceased observing and commenting on the living. Emily has died in childbirth, and wants to relive one mundane day in her life, against the advice of the other residents of the cemetery. She chooses her 12th birthday, but finds that it's too painful to watch the careless way her family goes about the day, not realizing how precious each moment is. The set is minimal and props are nonexistent. There's a black curtain across the back of the stage, and the only items onstage are two tables with chairs, representing the Webb and Gibbs family homes. The actors mime the action, whether it's frying bacon or snapping beans. The author, Thornton Wilder, wanted it produced that way in response to what he thought was wrong with theater at the time (what would he think of the overproduced shows on Broadway today?!). He said, "Our claim, our hope, our despair are in the mind – not in things, not in 'scenery.'" The only scene that comes alive with real props and colors and smells is Emily's flashback scene to her 12th birthday. The Stage Manager pulls back the curtain to reveal a bright and cheerful kitchen where Emily's mother, in period garb, fries real bacon on the stove. It's only in Emily's memory after she's died that the colors and beauty of life come alive. Another great feature of this production, which I'm coming to believe is the usual at Yellow Tree, is the music. The other two plays I've seen at Yellow Tree (String and Miracle on Christmas Lake) both had wonderful soundtracks of eclectic music that really helped to set the tone for the shows. This time we were treated to live music, thanks to narrator Blake Thomas, who would occasionally play guitar during the action of the play, and other members of the talented cast. Blake and Mary Fox (Emily) form a duo called Thomas Fox and have released a soundtrack of Our Town. It's mostly traditional folk/country music with a few originals. The cast performed in the theatre lobby before the show, and Thomas Fox are doing a concert this Thursday at Yellow Tree. I continue to be impressed with Yellow Tree Theatre. I'd tell you to go see this show, but it closes this weekend. Their next show is the musical [title of show], which is on my list of shows to see in 2011. So check them out sometime, it's worth the trip to the suburbs. FYI, this production was stolen from the Off Broadway production that ran a year ago. Every last bit of it except the music. It was reported to the Society of Stage Directors and Choreographers as theft of intellectual property. The directors were contacted by the SDC and were asked to credit the production that they copied. I am not aware if there was a fine rendered. Theft of intellectual property is illegal. They thought no one would notice. They were found out. How sad when a new professional theatre makes a go for it [and in this economy, no less] and another artist seeks to smear their name by making false accusations. To my knowledge, the SDC was completely supportive of their production, citing numerous other productions across the country who "borrowed" certain staging elements from the NY production] no fine was issued and the directors were 100% up front with the cast and their patrons about using certain elements of staging from the NY production. 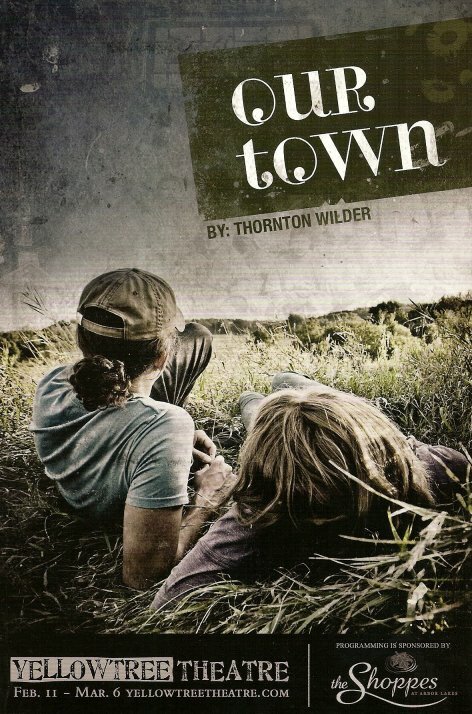 YTT's take on Our Town was original, [I have never seen or heard of a production of Our Town with original music, and live music before the show with the entire cast] and what a treat to have certain elements from a NY production brought to a small town in Minnesota. Why anyone would want to "take down" a new theatre that is beating the odds, doing amazing work and enhancing the cultural experience of its community is beyond me. Thanks for the comments. I don't know anything about this issue other than there was a note in the program crediting the NY production as an inspiration, so if there was a conflict it appears to have been worked out satisfactorily. And I do think the music added a lot to the production and made it unique (as with every show I've seen at Yellow Tree). I've been to every show this season and continue to be impressed with the level of effort and care that Yellow Tree puts into creating this little oasis of theater in a suburban strip mall, so I have a tendency to give them the benefit of the doubt.